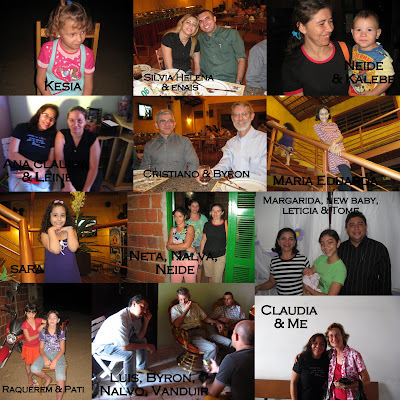 On our recent trip we were delighted to visit with many friends both old and new. At the two churches we visited in Fortaleza it was great to see many new Christians and hear about how they came to know the Lord. It was also our privilege to see many old familiar faces of those who accepted Jesus as Savior during our time of ministry. At the church in the Joao XXIII bairro, I am always delighted to see one certain lady. For two years I made visits and did Bible studies with a certain woman whom I had met at the boys' swimming lessons. All during that time she never made a decision about God in her life. She didn't know how to handle the fact that all of her family went to church on Saturday! And what would they think about her going on Sunday! If you don't know what church meets on Saturday, send me a note and I'll tell you! After we moved away she began to go to church for Sunday school only with her children, while still going with her extended family to the other church on Saturdays. Finally one day she realized that her problem was not a day of the week but a problem of the heart, mind and soul. The day arrived when she accepted Jesus as her Lord of all her life. Then she knew that she had never really wanted to admit that the church of her family was not teaching the facts about what salvation by faith for all truly is! On the morning we went to visit the church where she has now been attending for several years, I did not see her. I was a little disappointed, but she arrived, just a little late. After the Sunday school hour we hugged and kissed and I was able to say how happy I am to see her there each time that I visit. I saw many others that we thought we never come to make a decision that morning. One fellow with whom we had spoken for years was taking the roll - he is the Sunday school superintendent. Another fellow who was saved as a result of visits with my husband was called to helped with the Lord's Supper - he is a deacon. A third young man who got saved while we were at the church and married to a Christian girl in the church with my husband preaching his first wedding was present - he leads the music on Sunday mornings! Thank you, Lord! Thank you for allowing us to see some of the fruit of our labors. As our task in our current field of harvest seems dry and often difficult, we thank you for giving us some time to refresh and see friends! p.s. Mom, the top photo of a little girl named Kesia is Neide's daughter. She now has a little boy named Kalebe. He's in the other corner of the collage with her. 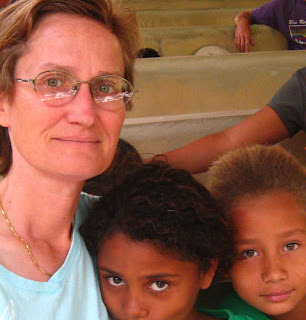 Nalva has two children as well! Misraela is going to get married they say at the end of this year after graduating from high school to a boy in the church named Josimar. Sun + sand + surf = refreshment and relaxation for mind, body, and soul! 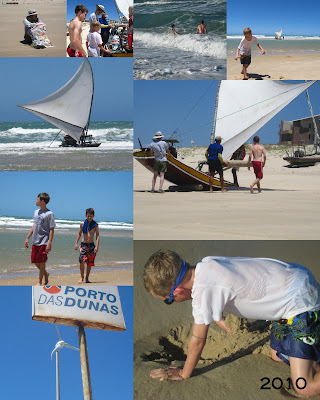 We recently enjoyed a few quiet days as a family in a secret quiet spot near Fortaleza. Look for more exciting articles, devotionals and musings next week as I get back into the routine of normal life! What do you say to a little girl who says - Take me home? During the second of our two recent retreats with the Aventura Brasil 2010 Missions Team, these two little girls asked me just that. One of the nights at the retreat these two little ones wanted to go on to bed before the lights out time. I agreed to go on up to our room with them while the older girl also their sister and another counselor stayed up to play table games. I told them to get their toothbrushes and we would all go to the bathroom to get ready for bed. We all changed our clothes and then I fixed their little mattress they had for sleeping - one for the both of them. I got their covers all fixed and tucked them in. Then I told them we were going to pray and then I would sing them some songs after I turned the lights off. They had both told me they don't like the dark, so I thought that would make them happy. So I sang my homemade translation of "Go to Sleep, Little Baby." They laughed and giggled. Told me to sing it again! Then the one said, Do your boys help you at home? I thought, That's a change of subject. Now they are trying to avoid going to sleep! But I decided to answer and said, Yes, some, but I do most of the housework. So then one of the girls said, You should adopt us and take us home with you after the retreat. Oh my, I had to think quick on how to answer this one. I thought to myself. Either this is part of the how long can we stay up game or a real serious kind of a little girl's thought. I decided to play a little dumb and said, Ah, I don't think I could do that. So then the other little girl said, Well, we know how to sweep and mop and wash dishes. We could do a lot of work for you. I responded with a "Oh, I bet you could, but I can't take you (plural). And the first responded back, Well, you could chose just one of us, and take just one. You can pick. We don't care which one you take. Just go ahead and pick one. Now, I had to pause and pray and consider carefully my next words. I told them how pretty they both were, and how nice they were, and how much I had enjoyed being with them, but I thought it might be better for them to stay together and go back home and tell their family about all the wonderful things they had learned at the retreat that week. I asked if they could do that. They said, Yes! Then I tucked them in again, and told them Good Night one more time. 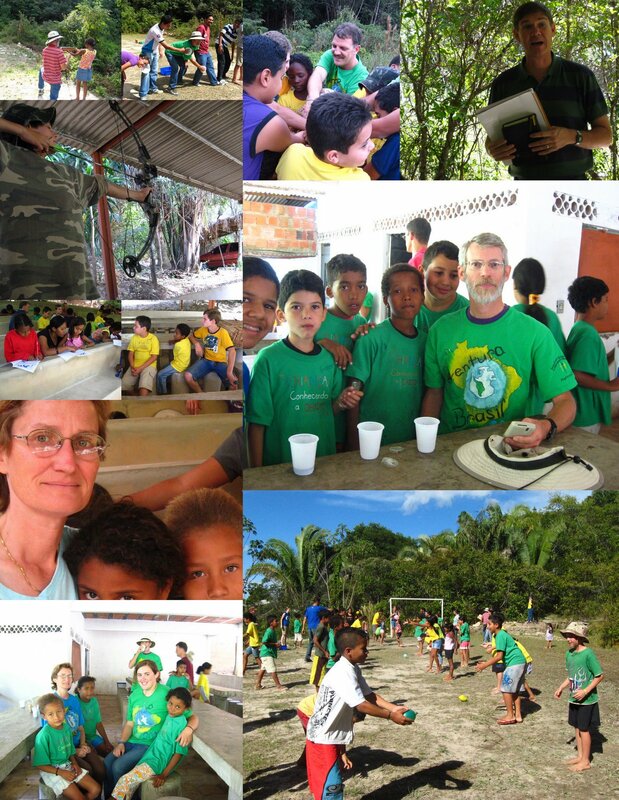 This past week our whole family traveled to the Cariri Valley in Ceara to help with the second half of the Aventura Brasil teams' time in Brazil. About 40 children participated in this retreat, mostly from the neighborhood near Missionary Jim Leonard's area congregation. 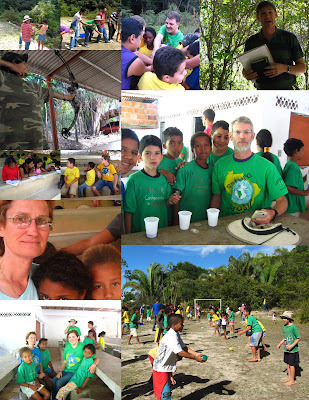 The retreat center was a lovely campground right on the side of mountains in the Atlantic Rainforest region of Araripina. Nights were super chilly and even the days were cool. Several children made decisions for Christ. Later I'll write about singing "Go to Sleep, Little Baby" in Portuguese to two of the little campers in the room where I stayed. Right now I am very overwhelmed with getting caught up after two weeks of camps and with school starting for the boys soon and very soon!